Is Marriage Just for the Middle Class These Days? I had all sorts of questions and issues about this piece, and I kept meaning to write something about it. Unfortunately, I couldn’t quite get my thoughts into coherent order. My main gripe, I guess, is that out of 4,000 words, more than 3,000 of them were dedicated to a description of two familes, one married, and the other headed by a single mother. This taught me virtually nothing, since the lifestyle differences between a married couple making $90,000 and a single mother making $25,000 are already pretty obvious to everyone. Beyond that, there was virtually no actual data about this phenomenon, and the data that was presented was confusing and, in some cases, seemed almost deliberately obfuscated. who got married, he warns, it might hurt other families if it tied them to troubled men. “You get back to the question of how many marriageable men there are,” he said. Right. There’s not much question that raising kids alone is financially crippling, and may be damaging to children in other ways too. I don’t think anyone challenges that. The real question is: why are there fewer marriages among families outside the upper middle class? Why are there more divorces? Why are men apparently less willing to make commitments to their children? Or are they? Maybe nothing much has changed among men, but women are no longer as willing as they once were to put up with abusive behavior. As with any question complicated enough to be interesting, I imagine there are lots of moving parts to this. But surely if you’re going to talk about it at all, one great big moving part is shown in the chart on the right: young, marriage-age men make a lot less money than they used to. 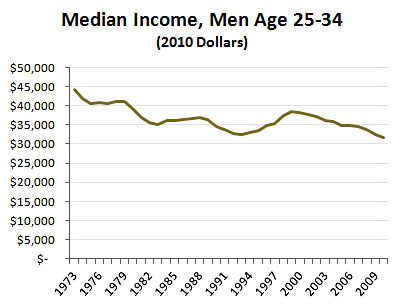 Adjusted for inflation, men between the age of 25-34 have seen their median incomes plummet from $44,000 in 1973 to $32,000 today. And I imagine that if I dug up historical figures for the bottom third, instead of the median, things might look even worse. Are men increasingly adrift? Less employable? Less desirable as husbands? It sure looks that way once you get out of the middle class. Income isn’t the only story here, but how can you spend 4,000 words on a story like this and not even mention it?